Neither of these is a wine, but as samples of both drinks landed on my desk at the same time – each quality, original products with several things in common – I thought they’d be of interest to wine-pages’ readers. Botonique is a new, herbal soft-drink specifically aimed as a grown-up alcohol-free alternative for wine drinkers. 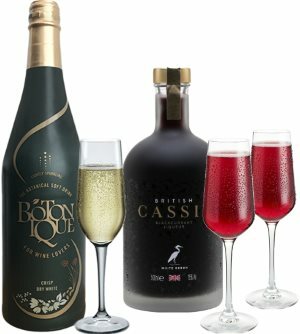 British Cassis, on the other hand, is a 15% alcohol liqueur made in Herefordshire, pitched as a premium luxury alternative to French crème de cassis, the classic blackcurrant base for Kir and Kir Royale. Coincidentally, both products have also been conceived by English women, the former by ex-wine merchant Hilary Marsh, who specifically wanted to create a non-alcoholic option for wine drinkers that had some of the complexity of wine, while the latter is the brainchild of Jo Hilditch, a fourth generation Herefordshire farmer who was brought up harvesting blackcurrants from the farm to make into jams, cordials, desserts, and now, British cassis. Quality is very good. The cassis appealed instantly, classic in its way but with an interesting tinge of herbal, perhaps less ripe English summer hedgerows. I confess Botonique was something of a shock at first, it’s high, green, almost medicinal aroma somewhat off-putting, but having read up a bit more and having taken the Botonique website’s advice that it was something of an acquired taste, the appeal of the drink really did grow on me: it is nothing at all like a wine, but neither is it like one of the many rather poor de-alcoholised wines that are on the shelves. It is distinctively individual in aroma, but one that does indeed grow on you. (2017) Despite bearing the legend "The botanical soft drink for wine lovers," do not expect this to taste like a de-alcoholised wine: it's very much its own thing, a lightly sparkling, herbal, bone-dry drink made from herbs, minerals, vitamins and amino acids that is certainly something of an acquired taste. On first sniff I found it aromatically odd, with pungent nettle, ginseng and chamomile 'high' floral and herb character, clove-like and medicinal. However I did grow to appreciate the fact that this is no weak wine substitute, but a fairly intriguing and grown-up alcohol-free alternative that has an under-ripe pear and citrus dryness and does keep you coming back for one more sip, even just in an effort to understand it. Certainly no shortage of character. Postscript: a second bottle tried around a month later seemed much less pungent, and was most enjoyable on a hot late May afternoon. (2017) Jo Hilditch is the founder of this Herefordshire operation, the cassis fermented from locally-grown blackcurrants using Champagne yeast, and using vodka as the fortifying spirit. It certainly has a lovely nose: essence of blackcurrant but also with something fresh and herby, a real English summer hedgerow note. Smooth and creamy on the palate, there's a lovely dryness and hint of sourness to offset the inherent sweetness. It would make a fine kir base of course, but a little could be sipped straight over ice. Price for 50cl. Interesting to see non-alcoholic drinks – what are yours thoughts on “Seedlip”? Scott, I haven’t tasted Seedip – and to be honest hadn’t heard of it until your comment. It will be interesting to see how it does, given it is as expensive as a premium ‘real’ gin for example.